Currently many medical devices are based on adjusting the mechanical characteristics of devices to the functional needs of the user without consideration of measurable clinical physical therapy suggestions. Thus, there is a need for creating clinical strategies based on clinical observations, emotional interaction of human being with a device, biomechanical simulations and balance control. Additionally, an advanced human factor design is necessary to prevent repetitive strain injuries and other musculoskeletal disorders, which can develop over time and can lead to long-term disability. 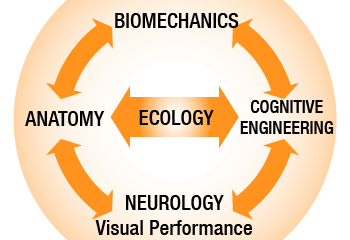 Multidisciplinary Approaches to Human Factors design draws on many disciplines in its study of humans and their environments, including anthropometry, biomechanics, mechanical engineering, industrial engineering, industrial design, information design, kinesiology, physiology and psychology. Chen, SJ, Gielo-Perczak, K. (2011): Effect of impeded medial longitudinal arch drop on vertical ground reaction force and center of pressure during static loading, Foot & Ankle International. 32(1):77-84. DiDomenico A., Gielo-Perczak K., McGorry R., Chang C. (2010). Effects of simulated occupational task parameters on balance. Applied Ergonomics 41(3):484-9. Gielo-Perczak K., Karwowski W., Rodrick D. (2009). Nonlinear behavior of the center of pressure in simulated standing on elevated construction beams. Work. Journal of Prevention, Assessment, & Rehabilitation, 34(2):195-203. Gielo-Perczak, K.: (2009): Strength of Shoulder During One-Handed Pushing in Constrained Conditions, Human Factors and Ergonomics in Manufacturing, Vol. 19 (5) 347–360. Gielo-Perczak, K., & Matz, S.(2007). The area of glenoid asymmetry identified as important contributor to shoulder strength during pushing and pulling in the coronal plane. Ergonomics, 50(11), 1856-70. Gielo-Perczak, K., Matz, S., & An, K.-N. (2006). Arm abduction strength and its relationship to shoulder geometry. Journal of Electromyography and Kinesiology, 16, 66-78. Gielo-Perczak, K. (2005). Editorial: State-of-the art musculoskeletal modeling and prognosis of its influence on the future directions of ergonomics theory. Theoretical Issues in Ergonomics Science, 6(3-4), 213-216. Gielo-Perczak, K. (2004). Maximum one-handed pull force and its relation to shoulder geometry. Occupational Ergonomics, 4, 143-155. Gielo-Perczak, K. (2001). Systems approach to slips and falls research. Theoretical Issues in Ergonomics Science, 2(2), 124-141. Redfern, M. S., Cham, R., Gielo-Perczak, K., Grönqvist, R., Hirvonen, M., Lanshammar, H., Marpet, M., & Pai, C. Y.-C. (2001). Biomechanics of slips. Ergonomics, 44(13), 1138-1166. Grönqvist, R., Abeysekera, J., Gard, G., Hsiang, S. M., Leamon, T. B., Newman, D. J., Gielo-Perczak, K., Lockhart, T. E., & Pai, C. Y.-C. (2001). Human-centered approaches in slipperiness measurement. Ergonomics, 44(13), 1167-1199. Winter, D. A., Patla, A. E., Prince, F., Ishac, M., & Gielo-Perczak, K.. (1998). Stiffness control of balance in quiet standing. Journal of Neurophysiology, 80, 1211-1221. Gielo-Perczak, K. (1989). Analysis and modeling of the glenohumeral joint mechanism structure. SOMA Engineering for the Human Body, 3(3), 35-46. Gielo-Perczak, K. & Rasmussen, J., (2008). Biomechanical modeling of the shoulder anatomy. In S. Kumar (Ed. ), Biomechanics in Ergonomics. Second Edition. (Chapter 15, pp.395-404). London: Taylor & Francis. CRC Press. Gielo-Perczak, K., Maynard, W. S., & DiDomenico, A. (2006). Multidimensional aspects of slips and falls. In R. Williges (Ed. ), Reviews of Human Factors and Ergonomics (Vol. 2, pp. 165-194). Santa Monica, CA: The Human Factors and Ergonomics Society. Gielo-Perczak, K. (2006). Biomechanical modeling of the shoulder. In W. S. Marras & W. Karwowski (Eds. ), Fundamentals and Assessment Tools for Occupational Ergonomics (2nd ed., pp. 27-1 — 27-12). Boca Raton, FL: CRC Press. Grönqvist, R., Abeysekera, J., Gard, G., Hsiang, S. M., Leamon, T. B., Newman, D. J., Gielo-Perczak, K., Lockhart, T. E., & Pai, C. Y.-C. (2003). Human-centred approaches in slipperiness measurement. In W.-R. Chang, T. K. Courtney, R. Grönqvist, & M. S. Redfern (Eds. ), Measuring Slipperiness: Human Locomotion and Surface Factors (pp. 67-99). London: Taylor & Francis. Redfern, M. S., Cham, R., Gielo-Perczak, K., Grönqvist, R., Hirvonen, M., Lanshammar, H., Marpet, M., Pai, C. Y.-C., & Powers, C. (2003). Biomechanics of slips. In W.-R. Chang, T. K. Courtney, R. Grönqvist, & M. S. Redfern (Eds. ), Measuring Slipperiness: Human Locomotion and Surface Factors (pp. 37-65). London: Taylor & Francis. Lemieux P.O., Gielo-Perczak K., Nuño N., Hagemeister N, (2012): Influence of the Stage of Massive Rotator Cuff Tear and of Adductor Co-activation on Activities of Daily Living: A Numerical Study; 6th International Shoulder Group Conference, Abersytwyth University in Wales, UK August 22-24. Tuite, E., Martori, A., Gielo-Perczak, K., Mendelson, Y., Goggins, K. (2011): Design of Individual Balance Control Device Utilized During the Sit-to-Stand Task”, Proceedings XXIIIrd International Society of Biomechanics (No. 941), July 3-7, Brussels, Belgium. Debayo, O., George, L., Marchand, M., Marrion, J., Gielo-Perczak, K., Higgins, L., Hoffman, A. (2011): Design of a new prosthetic alignment adaptor with quantitative alignment and height adjustment. Bioengineering Conference (NEBEC), Proceedings of the 2010 IEEE 37th Annual Northeast, (Digital Identifier 10.1109/ NEBEC.2011. 5778538), April 1-3, Troy, NY. Gielo-Perczak, K., (2010): A Method of Geometric Description of the Glenoid Fossa, Proceedings 34th Annual Meeting of American Society of Biomechanics (No. 351), Providence, Rhode Island, USA. Gielo-Perczak, K., (2010): Static Middle Deltoid Muscle Restraint to Superior-Inferior Translation of the Glenohumeral Joint. Proceedings of The International Shoulder Group (ISG) Conference, Minneapolis, Minnesota, pp.79-80. Gielo-Perczak, K., Matz, S.(2009): Influence of Glenoid Fossa Geometry on Shoulder Strength, Podium Presentation at the XXII Congress of the International Society of Biomechanics, Proceedings on CD (No. 584), Cape Town, South Africa. Gielo-Perczak, K. , Matz, S., (2007). New parameter identified as important contributor to shoulder strength. Proceedings of the Sixth International Scientific Conference on Prevention of Work-Related Musculoskeletal Disorders (PREMUS), Boston, USA, pp.55. DiDomenico, A., Gielo-Perczak, K., McGorry, R. W., & Chang, C.-C. (2007). Limitations of postural stability ratings. Proceedings of the Human Factors and Ergonomics Society 51st Annual Meeting, Baltimore, MD. pp.1219-1223. DiDomenico, A., Gielo-Perczak, K., McGorry, R. W., & Chang, C.-C. (2007). Influences of center of pressure and body segment movements on perceptions of postural stability. No.305611, Abstracts of the 18th Conference of the International Society for Posture and Gait Research, Vermont. Gielo-Perczak, K., DiDomenico, A., McGorry, R. W., & Chang, C.-C. (2006). Assessment of balance control while standing on a narrow beam. Abstracts of the 5th World Congress of Biomechanics – Munich, Germany: Journal of Biomechanics, vol. 39, Suppl. 1, No. 5231, S507. Gielo-Perczak, K., Matz, S., An, K-N., (2006). Arm strength during one-handed pushing and its relationship to shoulder geometry. Abstracts of the 5th World Congress of Biomechanics – Munich, Germany: Journal of Biomechanics, vol. 39, Suppl. 1, No. 4880, S78. Gielo-Perczak, K. (2006). Maximum one-handed pull force under constrained conditions and its relation to shoulder geometry. Abstracts of the 5th World Congress of Biomechanics – Munich, Germany: Journal of Biomechanics vol. 39, Suppl. 1, No. 5977, S166-S167. Gielo-Perczak, K., Matz, S., & An, K. N. (2006). An influence of glenoid geometry on Iisometric shoulder strength during one-handed abduction. Paper presented at the XVIth Congress of the International Society of Electrophysiology and Kinesiology, Torino, Italy, p. 219. Gielo-Perczak, K. (2005). An Investigation of the Congruity in Geometry of the Glenohumeral Joint on the Maximum Acceptable Load during Pushing. Proceedings of the XXth Congress of the International Society of Biomechanics and 29th Annual Meeting of the American Society of Biomechanics, Cleveland, OH. p.438. Gielo-Perczak, K., & Leamon, T. B. (2002). Individual load limitation of the glenohumeral joint as a prevention tool for musculoskeletal injuries. Proceedings of the 4th World Congress of Biomechanics (No. 5266), Calgary, Alberta. Gielo-Perczak, K., & Leamon, T. B. (2002b). An investigation of the individual differences in geometry of the glenohumeral joint on the maximum acceptable workload. Proceedings of 4th Meeting of the International Shoulder Group, Cleveland, OH. pp. 5-7. Gielo-Perczak, K., & Leamon, T. B. (2001). Ergonomic aspects in biomechanical analysis of the glenohumeral joint. Proceedings of the XVIIIth Congress of the International Society of Biomechanics, No. 786, Zurich, Switzerland. Chen, S.-J., Mercer, J. Gielo-Perczak, K., (2001). Effects of arch support on changes in arch height and center of pressure under different foot positions while loading. Paper presented at the Annual Conference of the American Society of Biomechanics, San Diego, CA. p. 353. Gielo-Perczak, K., Patla, A. E., & Winter, D. A. (1999). Analysis of the combined effects of stiffness and damping of body system on the strategy of the control during quiet standing. Abstracts of the XVIIth Congress of the International Society of Biomechanics, Calgary, Canada, p. 832. Gielo-Perczak, K., Patla, A. E., & Winter, D. A. (1998). Modeling of structural random response of body system during quiet standing. Proceedings of the North American Congress on Biomechanics, Waterloo, Canada, pp. 259-260. Winter, D. A., Patla, A. E., Prince, F., Ishac, M. Gielo-Perczak, K., (1998). Stiffness control of quiet standing. Proceedings of the North American Congress on Biomechanics, Waterloo, Canada, pp. 301-302. Gielo-Perczak, K., Patla, A. E., & Winter, D. A. (1997). Formulation of the body stiffness. Proceedings of the 13th International Symposium of International Society for Postural and Gait Research on Multisensory Control of Posture & Gait, Paris, France. Gielo-Perczak, K. (1994). Method of static load evaluation of the glenohumeral joint, Abstract Book of the Second World Congress of Biomechanics, Amsterdam, Netherlands, Vol. 1, p. 52. Gielo-Perczak, K. (1994). An analysis of stress transmission within the wrist joint, Abstract Book of the Second World Congress of Biomechanics, Amsterdam, Netherlands, Vol. 1, p. 59. Gielo-Perczak, K. (1994). Correlation of the geometry of the wrist joint with the load conveyed by the hand, Proceedings of the VIIth Conference of the Canadian Society for Biomechanics Calgary, Canada, (pp. 266-267). Gielo-Perczak, K. (1994). Method of static load evaluation of the wrist joint. Abstracts of the International Society of Biomechanics XIVth Congress, Paris, France, Journal of Biomechanics, 27(6), p. 759. Gielo-Perczak, K. (1993). Finite element modelling of the glenohumeral joint for trauma prevention. Proceedings of the VIIIth Meeting of the European Society of Biomechanics, 1992, Rome, Italy, Journal of Biomechanics, 26(7), p. 796. Gielo-Perczak, K. (1992). Biomechanical analysis of the wrist joint in ergonomical aspects. Abstracts of NATO Advanced Research Workshop: Advances in the Biomechanics of the hand and wrist. Brussels, Belgium, p. 32. Bignardi, C. & Gielo-Perczak, K. (1991). A 3-dimensional biomechanical model and analysis of femoral loads. Journal of Biomechanics, 24(6), p.486. Gielo-Perczak, K. (1991). Computer modeling of glenohumeral joint loads as related to gymnastic rings technique. Proceedings of the XIIIth International Congress of Biomechanics, Perth, Australia, pp. 70-71. Bignardi, C. & Gielo-Perczak, K. (1990). Mechanical aspect of 3-dimensional modelling of femoral loads. Proceedings of the VIIth Meeting of the European Society of Biomechanics, Aarhus, Denmark, p. 43. Gielo-Perczak, K., Bignardi, K., Calderale, P.M. (1990). Mechanical analysis of 3-dimensional modeling of the femoral loads. Abstracts of the First World Congress of Biomechanics, San Diego, CA, Vol.1, p.175. Gielo-Perczak, K., & Calderale, P. M. (1990). The effects of overloading and the injuries of the glenohumeral joint in sports. Proceedings of the First World Congress of Biomechanics, San Diego, CA, Vol.1, p. 124. Siwicki, I., Komor, A., & Gielo-Perczak, K. (1989). CSSP – Continuous Simulation Software Package: An interactive package dedicated for simulation of biomechanical objects. Proceedings of the Second International Symposium on Computer Simulation in Biomechanics, Davis, California, p.5. Gielo-Perczak, K., & Morecki, A. (1989). Biomechanical analysis of the glenohumeral joint in ergonomical aspects. Proceedings of the XII International Congress of Biomechanics, Davis, California, pp. 382. & Journal of Biomechanics, 22(10), p.1015. Komor, A., Faina, M., & Parfianowicz, L. & Gielo-Perczak, K. (1989). The use of mathematical modelling and computer-aided simulator in cycling motion performance improvement. Proceedings of the First IOC Word Congress on Sport Sciences, Colorado Springs, CO, PH-46/1 p. 337.